More Tales of Medieval Dublin follows on from our very successful Tales of Medieval Dublin series which ran between 2010 and 2012. Each ‘Tale’ focuses on a different, fascinating inhabitant of the medieval city allowing modern audiences a chance to ‘meet’ their predecessors. These brief biographical sketches provide a unique way of viewing the exciting episodes and developments in Dublin’s history. Spanning Dublin’s pre-Viking roots all the way up to the early seventeenth century, people from all walks of life are discussed, though there is a particular emphasis on the everyday men and women who were the backbone of the community. From pilgrims to heathens and widows to exiles, these talks should interest fans both new and old. In this series there will be six lunchtime lectures that will take place between September and February (2018-2019). 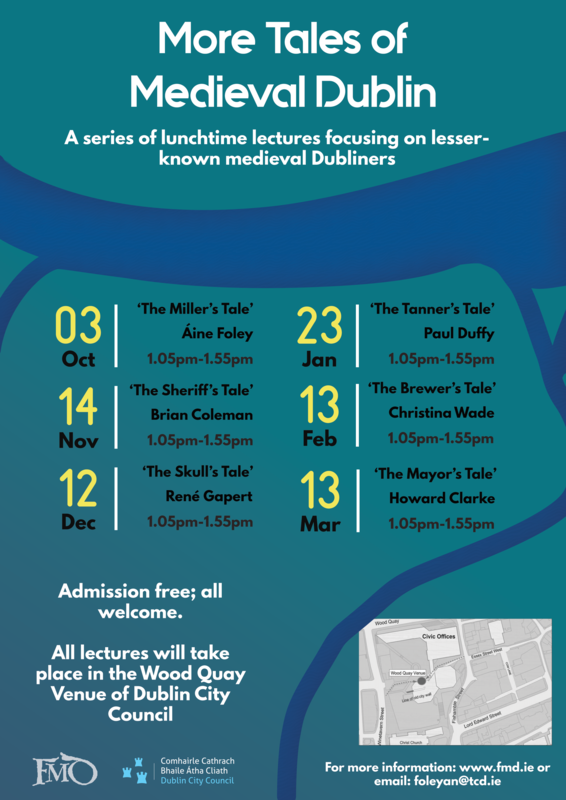 All of the lectures will begin at 1.05pm and will take place in the Wood Quay Venue of Dublin City Council.